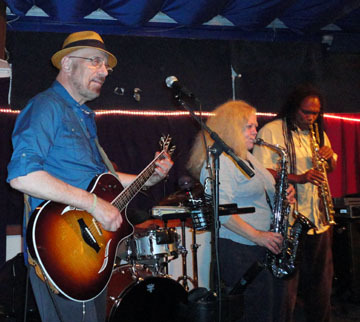 The GATERS, with Sandy Bailey, Maggie Catfish, Joe Tate and Lonnie Walter have been playing the early Saturday evening music set for quite a while and they are booked through till October 29 in this time slot. The name derives from locale’ rather than a type of reptile. The Gates is a section of the waterfront where liberty ships were built in WWII. Gate 3, which is near Mollie Stones Market, was the center of the ways where most of the final assembly and launches took place. Most of the houseboats are located around Gate 5 and 6. It was in this area that The Redlegs, a 70s rock band, once flourished. Catfish and Tate were members of The Redlegs and are now content just to be GATERS. 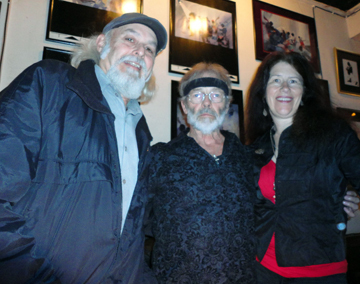 They have teamed up with Lonnie Walter, who grew up at the Gates and Sandy Bailey who lived in Sausalito back in the day. The group has departed from the usual guitar, bass and drums rhythm section and instead use bongos, ukulele and bass ukulele. This provides an intimate sound that is easy on the ears. 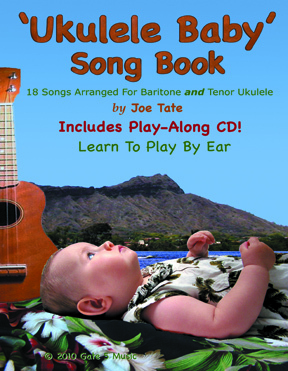 The ukulele bass, played by Bailey, has the same tonal range as a regular bass but with faster attack and decay, the rising and falling volume of each note. This adds to the percussive effect of the bongos. The ukulele played by Catfish also adds another strong rhythm element. Taken all together with Tate’s guitar and the three part harmony, it’s a very compelling sound. 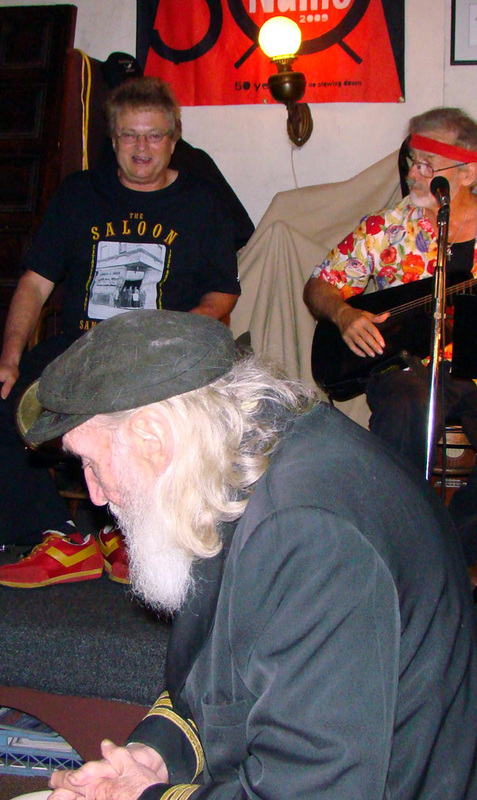 On many songs, Tate sings old favorites in a strong baritone voice while Bailey and Catfish lay down harmonic background lines. Then, effortlessly they segue into three parts. Fats Domino’s music is well represented along with The Coasters and Tate has a version of Cab Calloway’s Minnie The Moocher that brings the house down. 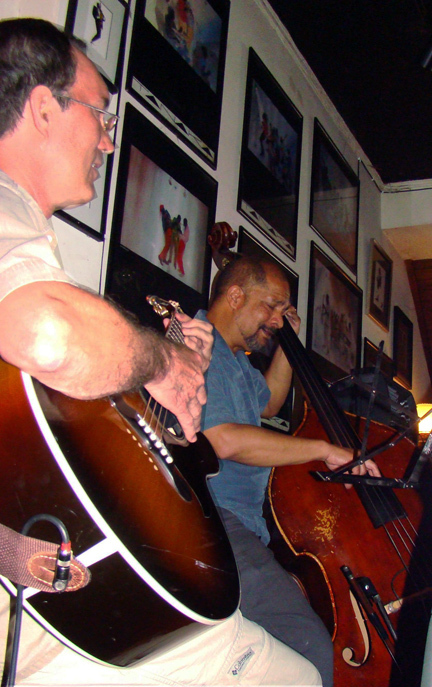 Another favorite at the No Name Bar is Bailey’s rendition of On Bridgeway, a send up of George Benson’ On Broadway. 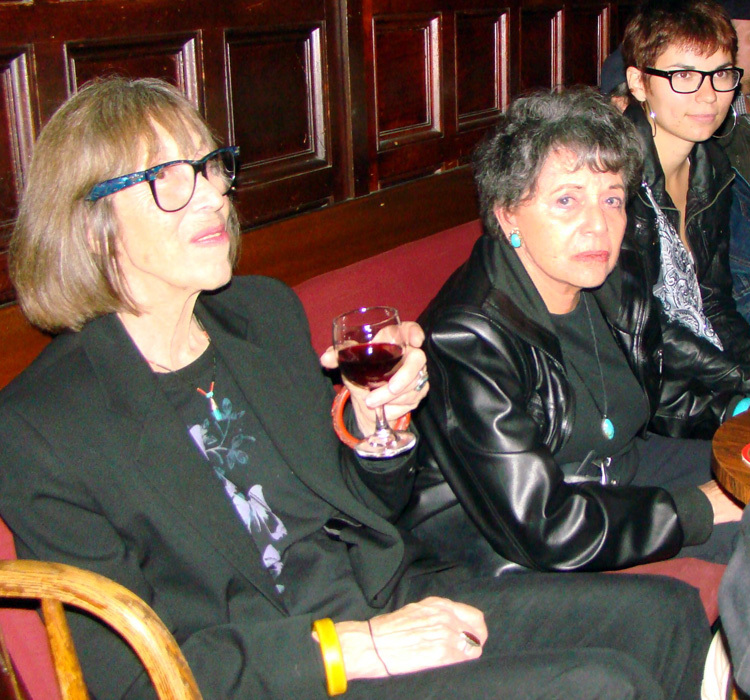 There were some notables in attendance including Margo St. James, Kayla Kahn and Larry Moyer. There are those who say these folks used to live at the No Name Bar. Nowadays, James lives up north and only visits occasionally while Kahn can often be spotted at Bridgeway Gym. Moyer, ever the artist, spends most of his time in a floating studio anchored offshore from Gate 5. One of Sausalito’s most respected artists, his paintings grace city hall and are in high demand. He still cranks them out on regular basis, seldom bothering to come ashore. Night Beat digresses though. 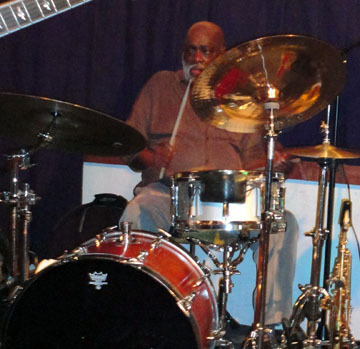 Lonnie Walter takes a couple of amazing solos and demonstrates why Tate calls him Showtime. There’s a tune called Nasty Little Boy, Tate’s biographical account of not behaving well, in which Walter blazes away on the bongos while simultaneously doing all these dance-like motions with his arms. After some New Orleans stuff like Rockin’ Pneumonia, the genre shifts to Hawaiian and doggone if it doesn’t feel like the Islands. 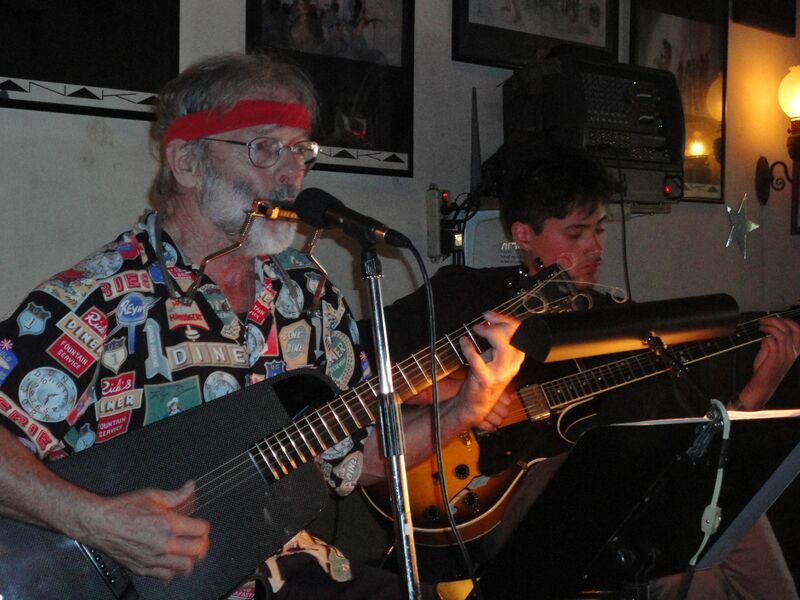 This starts with the well known Hanalei Moon, Bob Nelson’s hapa haole classic. Tate has his own hapa haole song called Pahala. It’s quite beautiful and it is about a small town in Hawaii where he had attended a Hawaiian music workshop. Apparently some of it rubbed off on him. Maggie Catfish tops off this section with Moon Of Manakoora, a Hollywood created song first sung by Dorothy Lamour for the movie, Hurricane. There’s also a lot of trading instruments between these players. They call it musical instruments. Bailey usually has the bass. But then he hands it to Catfish and starts playing ukulele. Tate sometimes gets out a uke too. But this one has eight strings and sounds like a harpsichord. When this happens, Catfish plays guitar. They do Troubled Times in this configuration, a lament about losing a job, having a house foreclosed and going to jail. It does ring a bell. This a video slide show of one of our songs about sailing away in the Richmond. 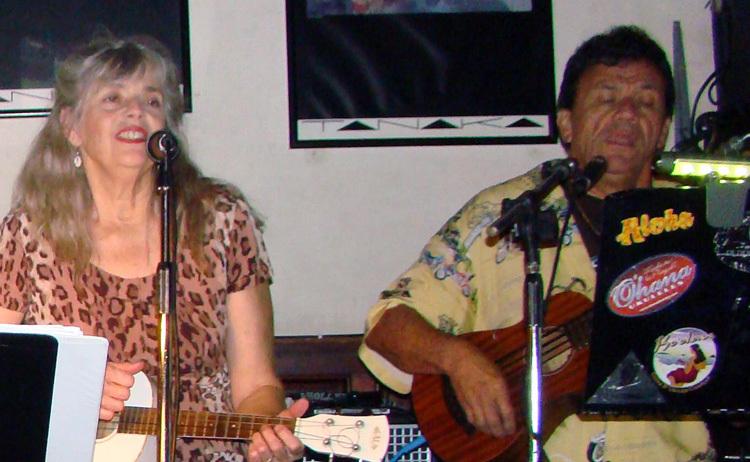 The Sausalito Cruising Club often hosts the Medicine Ball Band Sunday afternoons from 5-9:30 PM. This group must be one of the best-kept secrets in the Bay Area music scene. Their excellent music far exceeds the notoriety they have been accorded. Today they are joined by Wendy DeWitt, the Queen of Boogie Woogie, on piano. With Ylonda Nickell on alto sax, John Stafford on various woodwinds, Richard Howell on soprano and tenor sax, Larry Vann on drums and kirk Harwood on congos, the group is rounded out with vocals by Thea Rose, a sweet young singer adept in the ways of jazz. Starting with a couple instrumentals, DeWitt sets the pace with one of her classic boogies rendered in her own inimitable way. 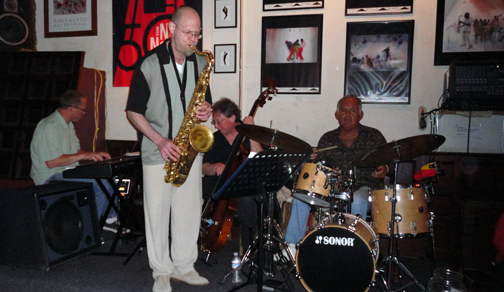 Careless Love follows with John Stafford leading the way on tenor sax. The beautiful Thea Rose takes the stage and belts out Who Could ask For Anything More?, followed by Otis Redding’s Dock Of The bay, sung in a clear tenor voice. Ms. Rose is in the tenth grade at Terra Linda High, and plays cello, piano and guitar. Her uncle gave her a Billie Holiday CD when she was seven and she has been enthralled with jazz ever since. Her Favorite singer is Ella Fitzgerald and favorite musician is Thelonius Monk, just to give you some idea of where she’s coming from. When time and circumstances permit, she sings with the Medicine Ball Band as she has for the last two years. After a break she returns with Lullaby Of Birdland, which is completely over the top. Sturdevant and Stafford toss in an incredible harmonica-clarinet duet that makes the whole performance click. Sturdevant sings My Blue Heaven, written by Walter Donaldson with lyrics by George A. Whiting in 1924. The dance floor fills up with this one, and DeWitt’s keyboard work transports us to the 50s’ and Fats Domino. We get some more of the harmonica-clarinet instrumental section. Apparently Sturdevant and Stafford have been working this routine up. They are planning a tour of the US to showcase what they have been creating. After the break they give us a demo of playing just harmonica and clarinet. It starts off seeming to be just amusing, but them morphs into a full blown musical tour de force. There was some good blues on the menu too. 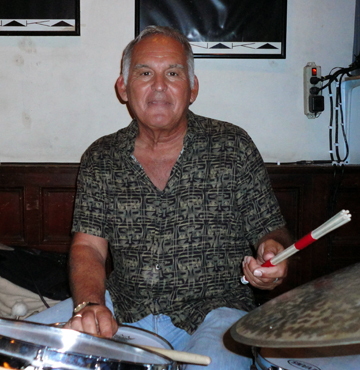 The drummer, Larry Vann, is a true original as he delivers his song, Down In Shady Lane, played in 4/4 but overlaid with 6/8 time. It is slow and soulful and you know you are hearing the real deal. Not to be outdone by all the name dropping, Ylonda Nickell, takes over the proceedings with her rendition of Misty. Starting a with a slow, roboto introduction, Nickell launches into something bordering on Rhapsody In Blue, Gershwin’s monument to stately blues. Nickell has a way of expanding a simple song like this into a kind of symphony with many movements. There was lots of other good stuff including Feelin’ Alright, of Joe Cocker fame and sung here by Stafford. Sturdevant and Stafford team up for some vocals too, like on Sweet Georgia Brown, written in 1925 by Ben Bernie and Maceo Pinkard (music) and Kenneth Casey(lyrics). It’s good to hear some male harmony and these guys are getting ready for the road so they have really tightened it up. They will be back from their tour in October. 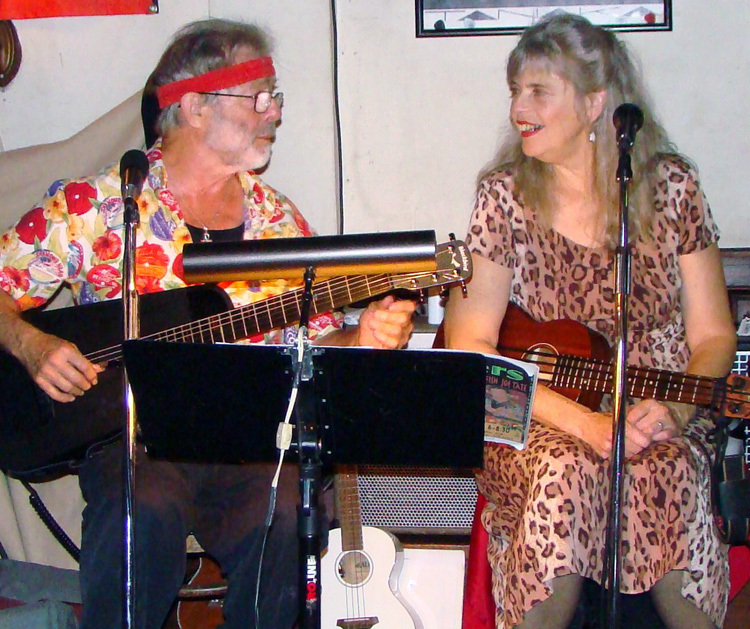 You can hear them at the Sausalito Cruising Club on Sunday afternoons a couple of times a month. 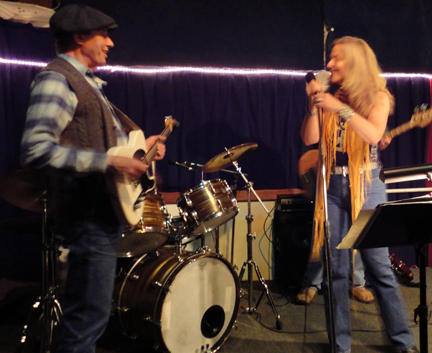 If you are a musician, please come to the Blue Monday Jam Sessions at the Sausalito Cruising Club every Monday at 7. 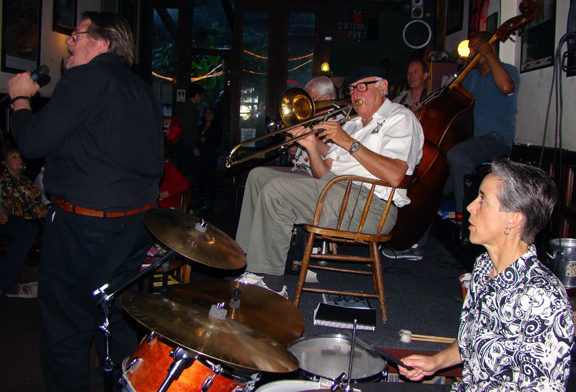 Mal Sharpe’s Big Money In Jazz Band has been playing at the No Name Bar in Sausalito, CA every Sunday afternoon since about 1990. Listening to them is an authentic trip down yesteryear. It’s like going back to the roaring twenties to a time before any of us were born (including Mal Sharpe) to an era of good times and no worries. Mal sings some songs you may never have heard of, but they really swing. 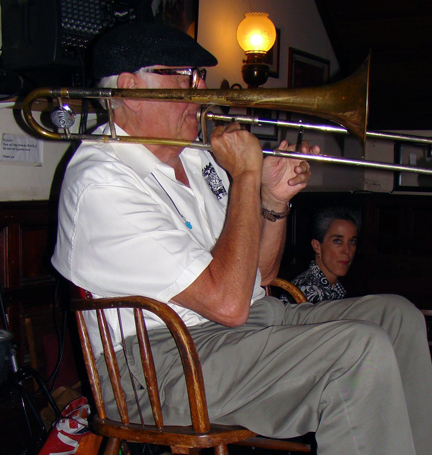 He belts out Goin Back To Indiana, then gives it the trombone treatment as only he can do. 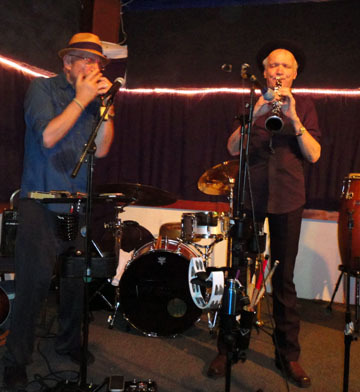 With the clarinet, coronet and trombone weaving an intricate melodic web, it’s New Orleans in Sausalito. 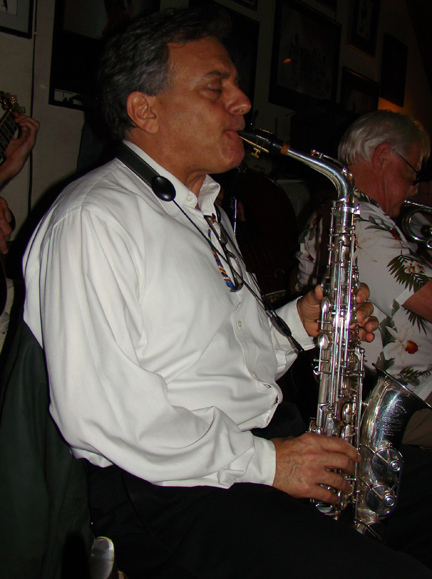 That Clarinet is played by Jeff Sanford who doubles on saxophone. Sharpe takes turns with Sanford on solos with equal time given to Leon Oakley on coronet. 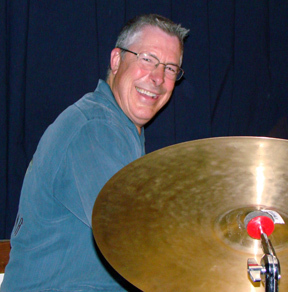 The sound is rounded out with a solid rhythm section consisting of Carmen Consino on drums and Joe Mckinley on Bass. 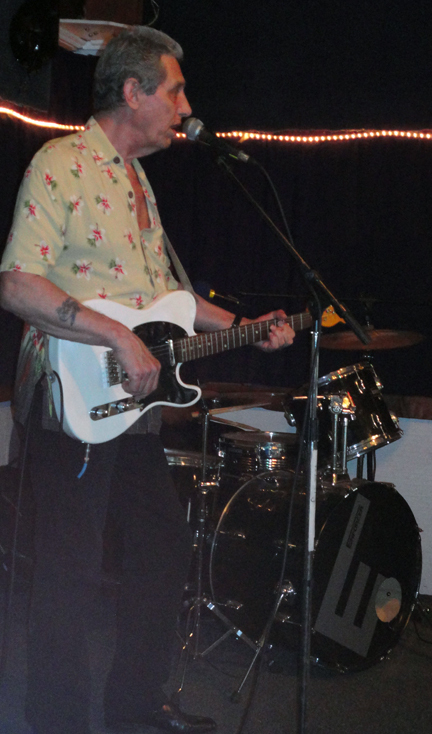 Chords are laid down on guitar by Bill Dekuiper. After a few songs they are all joined by Faith Winthrop on vocals for her rendition of Cheek To Cheek, the Irving Berlin classic. She sings with a well trained voice that is dripping with sweet inflections of the Jazz Age. Following this is Louis Armstrong’s Someday You’ll Be Sorry in which the full impact of the band and singer adds exponentially. 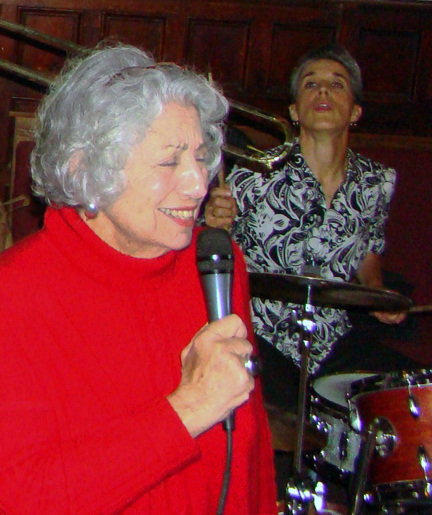 Winthrop, who grew up in Boston, came to Sausalito in 1955 where she lived for a while and during which time she sang at the hungry i in San Francisco. After wandering to Los Angeles, New York and other points east, she returned here in 1965 and married. 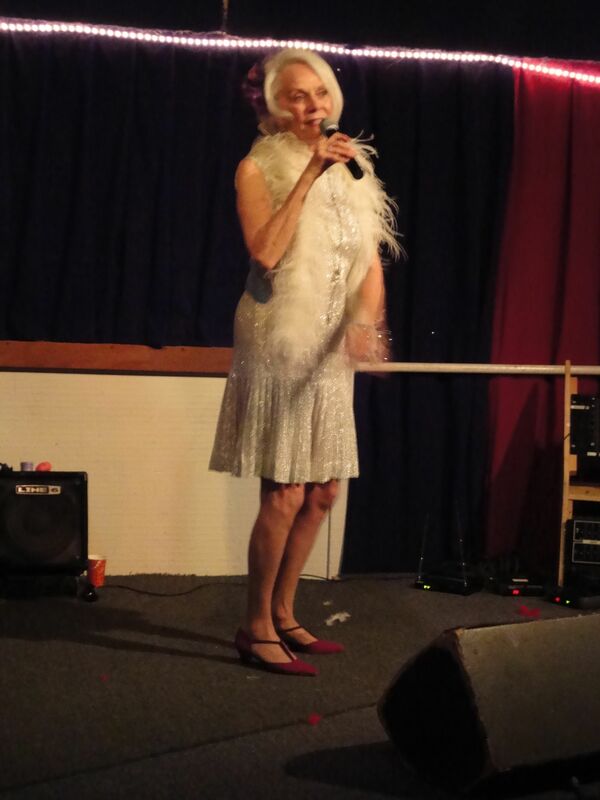 She was a featured singer at the Razz Room for many years and has lately been appearing here regularly with Mal Sharpe’s Big Money In Jazz Band. Here’s hoping she continues here for the foreseeable future. There is a request for Basin Street Blues which is happily obliged by Sharpe who delivers the vocal. Everybody solos including the guitar driven by Bill Dekuiper. This is Kenny Burrell redux with a strong taste of blues. When the drums came in, it was in four bar segments, with Consino playing four bars solo and then four bars with the band with maybe four reps.
Winthrop returned to the stage and sang Ain’t Misbehavin, the wonderful standard from Fats Waller. 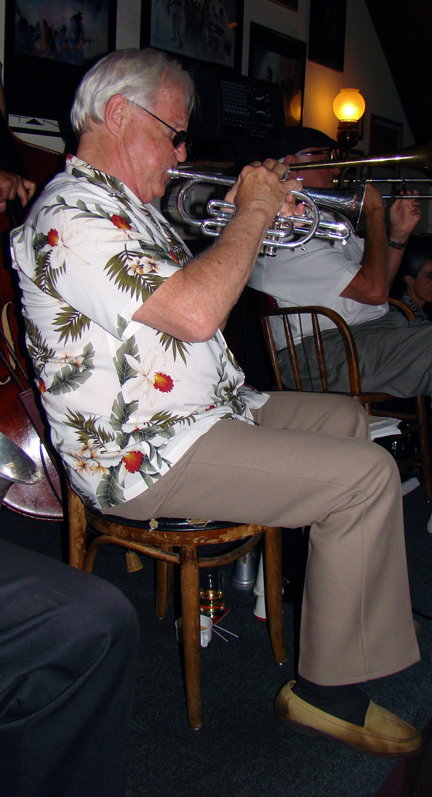 This song, written in 1929, is perfect for Dixieland with its drawled out melody and swing rhythm. A song called New Age Old age is next. This is a twelve bar blues that was written by Winthrop. Winthrop continued on with Wrap Your Troubles In Dreams, written by Harry Barris, Ted Koehler, and Billy Moll but made famous by Louis Armstrong. This is an especially beautiful song and when her lovely voice gave way to the sax, it was music heaven, with new and inscrutable melodies filling the room. Mal Sharpe took over for a few minutes with I Want A Little Girl, another song made famous by Louis Armstrong. Winthrop returned right away though with I’m Beginning To See The Light, a Duke Ellington song that was a hit for Ella Fitzgerald. On this song, the coronet and and alto sax take fours. The rhythm section continues while Dekuiper and Oakley take turns at four bars each. It works up into a frenzy when they change it to two bars. They all come in climatically and then fall off as the voice comes back in. Dramatic! At this point, Tao Jones, a regular performer at the No Name Bar, shows up and sings Just A Little While To Stay Here, a gospel favorite of unknown provenance. With a strong baritone voice, he leads the band into some new territory and it starts to rock. At least that’s what the audience was doing. At The Jazz Band Ball, a fast tune by Louis armstrong, is played with hot instrumentals and drum breaks. The drum breaks aren’t just fours, but actual solos this time around. Winthrop comes back and sings Georgia, with a false start and a key change. After changing from Eb to Bb, it comes off beautifully with a super solo on soprano sax as well as trombone. She gives us one more with A Hundred Years From Today, a song written by Victor Young, the lyrics by Ned Washington and Joe Young. The song was published in 1933. This song is about how we should enjoy life because what we do won’t matter in a hundred years, a contention that is losing favor these days. Mal Sharpe ends the set singing The Song Has Ended, another by Irving Berlin but made famous by Ella Fitzgerald. 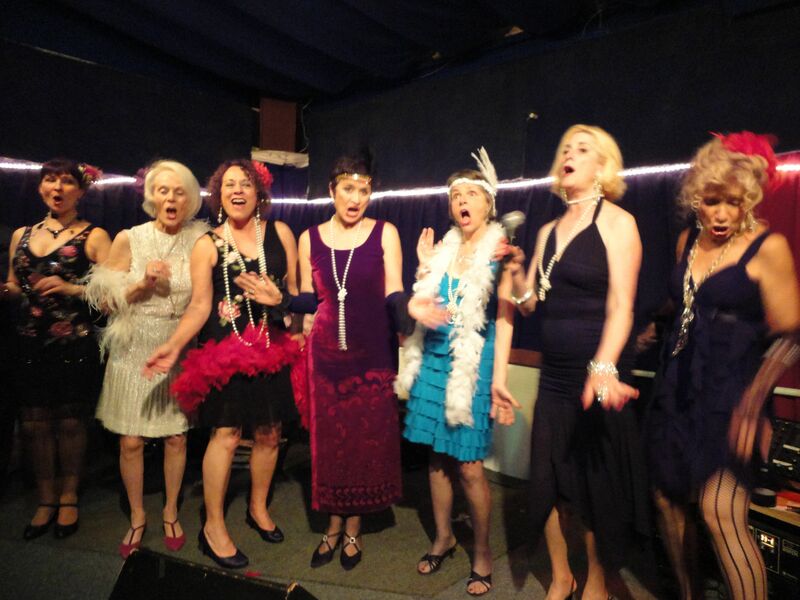 Every month or so, the Sausalito Cruising Club hosts Cabaret Night, produced by Kathy Holly, who brings together a wonderful retinue of singers and musicians to perform cabaret style entertainment. Tonight the theme is “Back To The Roaring 20s” with Kathy Holly et al in costume. 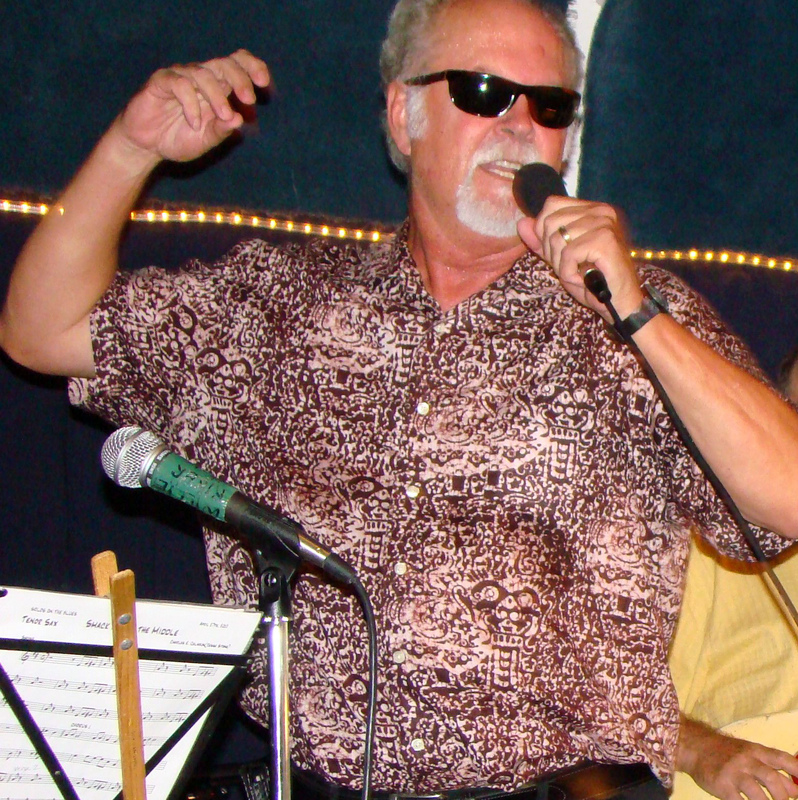 For the Sausalito Cruising Club, which usually hosts pop and blues bands, this is a bit of comic relief. These gals deliver some really fine music though. With their sweet voices and the expert backing with David Miotke on piano and Chris Amberger on bass, the music touches the senses in ways seldom heard nowadays. The ladies take turns doing a couple songs each, starting with Connie Ducey who lays down More Than You’ll Ever Know and My Baby Just Cares For Me, the Walter Donaldson/Gus Kahn song written for the Ziegfeld comedy, Whopeee, Staring Eddie Cantor. Kat Fitzgerald takes the stage and gives out Wild About Harry,a song written in 1921 with lyrics by Noble Sissle and music by Eubie Blake for the Broadway show Shuffle Along. The interaction between her and the piano is sweet syncopation that quickens the pulse. The response is manifested by the folks on the dance floor. 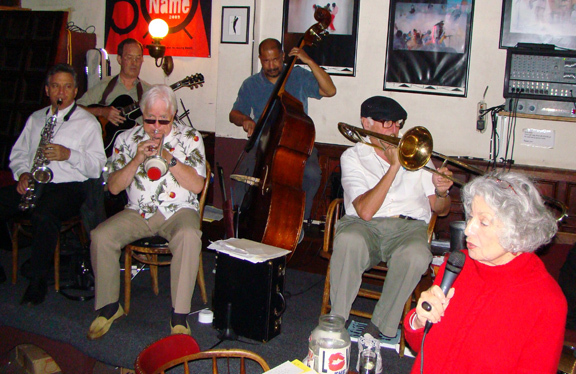 Some of the other solos included Kathy Holly singing Hard Hearted Hanna,the much recorded tune written by Milton Ager, with lyrics by Jack Yellen, Bob Bigelow, and Charles Bates. Her energy is overflowing and infects everyone listening. The grand finale, shown above, was Anything Goes, from the Cole Porter musical of the same name. 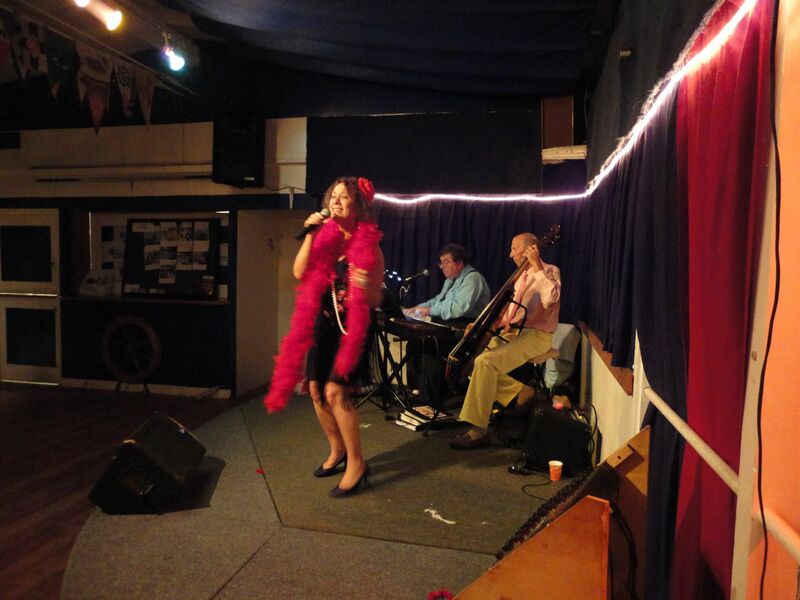 The Cabaret Night will return to the SCC on September 22. 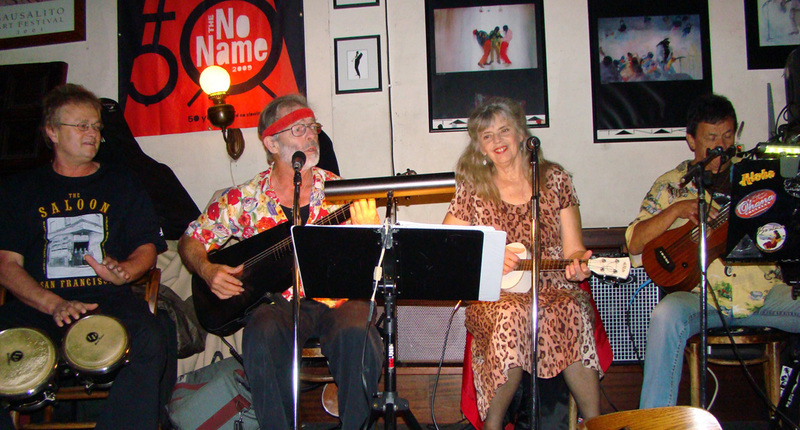 Just down the street at the No Name Bar, Joe Tate and Friends hold forth every Saturday evening at 6. 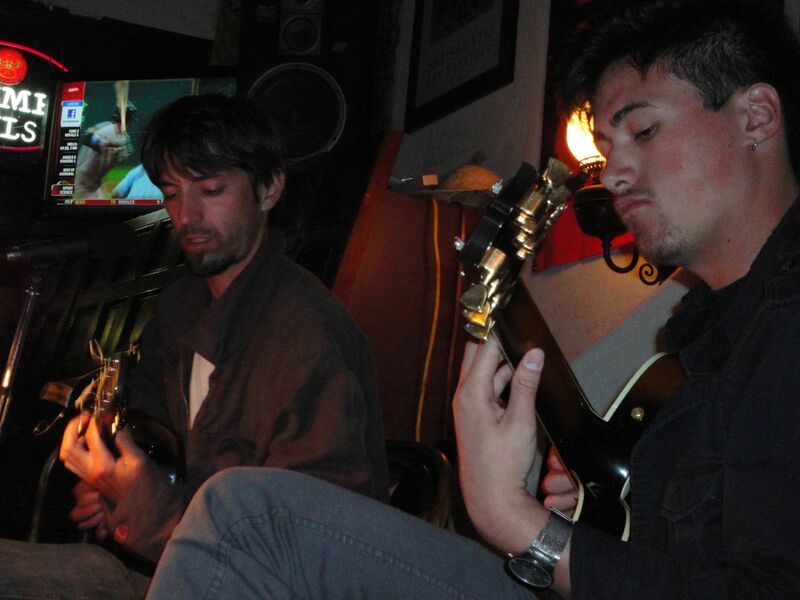 Tonight, Tate is joined by Miles Ceralde, a very talented young guitarist who adds just the right touches to Tate’s vocals and rhythm guitar. Joe Tate and Miles Ceralde What is that chord? 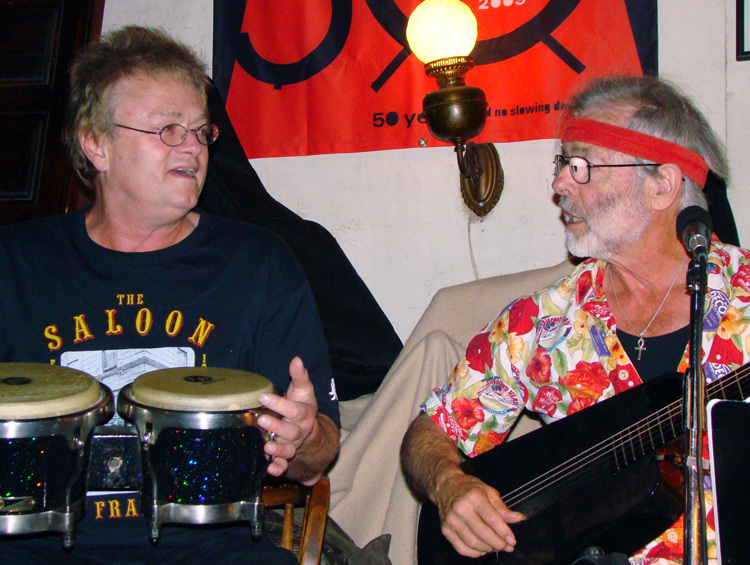 Both are backed by Lonnie Walter on bongos, giving the music a coffeehouse flavor. Although Tate throws in a few protest songs, it’s not the folksinging style of the sixties, but rather a mix of sophisticated standards and regular old blues and pop. Tate sings a few songs of local interest too, like Sausalito Girl, his own composition about the artist women of Sausalito. You might also hear him sing Dock Of The Bay, the famous Otis Redding song written when the soul/bluesman visited here shortly before his death. Sitting in tonight is Gabe Navarre, a local guy who could play Hendrix licks when he was a teenager. Now he has developed a wonderful singing voice that is powerful and distinct. When he sings Randy Newman’s Guilty, the walls shudder from his deep baritone setting everything in motion. Occasionally, Gabe appears here with Tate for the entire gig. They are scheduled to play here August 27. If you haven’t heard him, this is the opportunity. 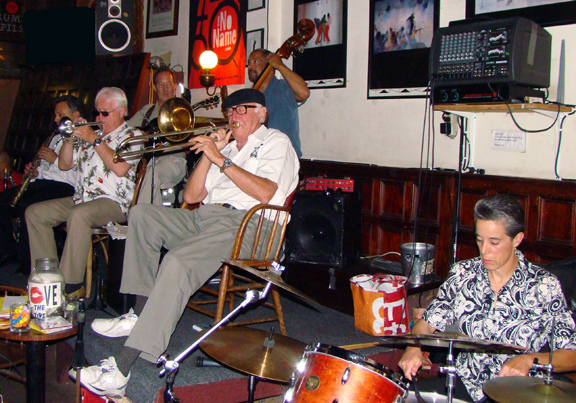 The Final Touch Band comes to the Sausalito Cruising Club as part of the legacy from the Blue Monday jam sessions that were led by Billy Dunn and Michael Skinner here some years back. 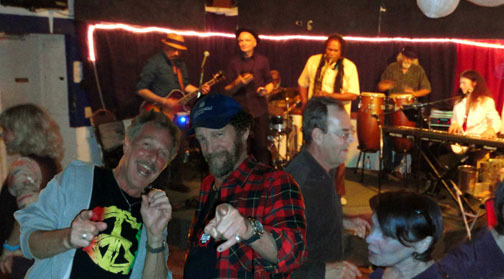 Although The Final Touch Band predated the jam sessions, it was some time before FTB would be playing their spectacular brand of rhythm and blues at the Sausalito Cruising Club. 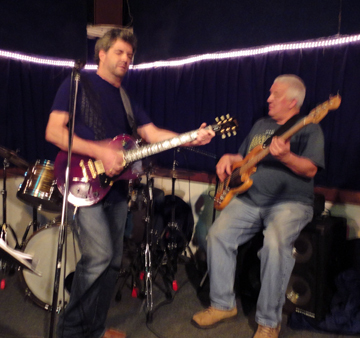 Joining FTB tonight are guitarist Steve Gannon and bassist Larry James, both members of the old SCC jam band. 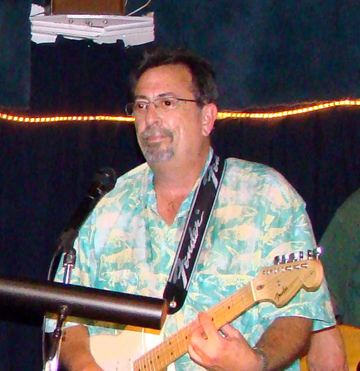 Although The first Sessions featured Pat Wilder on guitar, Gannon became the regular for several years. 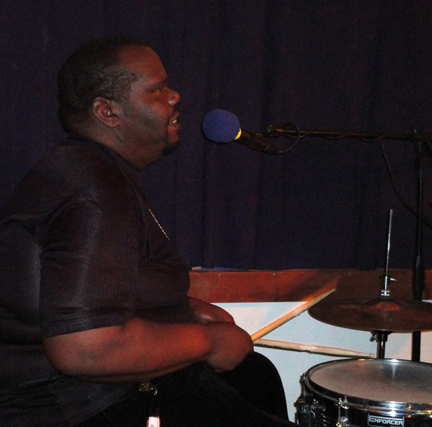 The Final Touch Band is the brainchild of Michael Skinner, a talented drummer/singer who grew up in Richmond, CA where as a youngster he played and sang with the Spiritual Corinthians. He learned music from his late brother Melvin and his uncle both of whom were members of the Spiritual Corinthians. He graduated from Harry Ells High School in 1984. “Charisma” was his first band. Soon he would be playing with Beverly Stovall at the Serenader Club in Oakland, CA where he met up with Billy Dunn and later Curtis Lawson. This was his core group leading up to the formation of the FTB, which at first was with Leonard Hawkins, Dale Whitmore and Larry James on guitar. Tonight, Richard Younger is subbing for Hawkins on keyboards. He’s a funny guy all laughing and joking. The way he moves around the keyboard, he looks like Ray Charles. Michael Skinner’s rendition of Mustang Sally is something to behold. With his powerful gospel trained voice, he lends incredible power to this Wilson Pickett classic. The ending, which Michael arranged, is like no other and is an apt demonstration of this band’s power. All their songs have great endings. 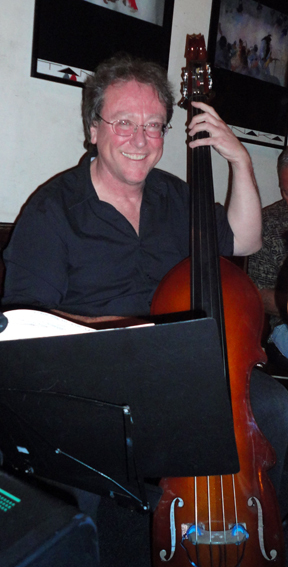 Bassist Larry James, who doubles on guitar, can really belt out some oldies but goodies too. His version of Shake rattle and Roll segues into shout, the Isley Brother smash from yesteryear. 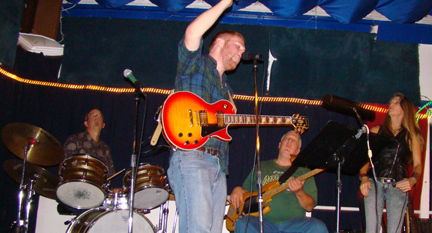 Steve Gannon delivers up some good blues with Howlin’ Wolf’s, Baby, How Long. This man can play some guitar too, and in a most pleasing way. His playing can be searing and laid back at the same time. Sort of like sweet and sour, it’s delicious. Gannon, who grew up in London, came to Oakland in 1985 after the end of a ten year marriage. 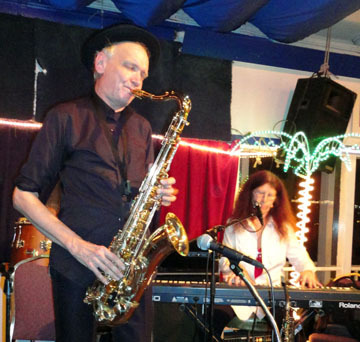 When he was invited to Eli’s Mile High Club in Oakland, he played with Beverly Stovall and Sonny Rhodes who took him on tour of Canada with his band. Steve wound up playing in the house band at Eli’s three nights a week. There was an after-hours club called Deluxe Inn where he finally met Michael Skinner sometime in the 80s. Later he hooked up with Billy Dunn in Curtis Lawson’s band where he shared guitar duties with the late Drake Levin. There was one other little surprise for the night; Joe Tate showed up and sang a couple of old favorites like Blueberry Hill and High Heeled Sneakers, which is done in a medley of songs traded back and forth between Tate and Skinner. It went sort of like this; Tate sang a verse of High Heeled Sneakers then Skinner sang a verse of Big Boss Man. Bits of several songs were strung together with alternating singers in a sort of faux competition. Amusing.